The Inglesina Quad scored below average in most metrics and didn't fare well in comparison to the other strollers we reviewed. While it is a nice looking product, it did not score well for ease of use, and the maneuverability is only better than one other product. We feel if a stroller is hard to push it is a bad choice no matter what else it has to offer. In short, we wish that this stroller brought more to the table and we think most parents will be happier with other options that might cost less or comparable to the Quad. Liviano Tomasi started Inglesina in Vicenza Italy in December 1963. Inglesina means "feminine" in Italian, which is similar to "pram" which means "little girl" which inspired Liviano to create his first stroller, the "London". Inglesina prides itself on continued design advances with safety, protection, comfort, and reliability in mind. The chart below shows a comparison of the overall scores for each stroller tested in this review. The Inglesina Quad is shown in blue. The sections below provide more details on how the Quad performed during testing for each metric. The Quad is a larger stroller. The Inglesina earned a 5 of 10 in the ease of use category, which puts it just below the average. Part of the Quad folding process includes removing the seat and pulling the lever while pressing the button. This stroller requires 2 hands to fold, but it has an auto-lock feature, self-stands, and comes with a carry handle. Folding the stroller is a 4 step process with a slight learning curve. It is a two part fold, but it might be easier than some with fewer parts. The frame self-stands easily and the seat can stand on its plastic bottom. The brake on the Quad is hard to use and during testing we often thought it was set when it wasn't. The Quad has single action brakes that are not sandal-friendly. They are only average for ease of setting and release. The major problem is that during testing we had trouble setting the brake as it can go partway and feel locked when it isn't. We recommend parents double check the brake to ensure it is fully engaged. The best access for the storage bin on the Quad is from the side, but the front, back, and top bars limit how much you can put in it. The Inglesina has a medium size storage basket with a maximum allowable weight of 6.6 lbs. This will limit what you can store and it will be easy to go over the limit. We were able to fit a medium sized diaper bag inside with access from the sides and back. The Quad's bottle holder is deep, but narrow. This stroller has a cup holder on the side of the handlebar with a 1.1 lb limit. It has an open bottom design, so it is not suitable for holding smaller items. The cup holder is removable and will make the stroller easier to fit in your trunk. However, in our experience, taller bottles tend to tip the holder and fall out. The peek-a-boo window on the Quad is made of vinyl and is relatively large. The sunshade is fairly large and it does not list an SPF rating. It has a medium sized, vinyl peek-a-boo window with no cover to keep out the sun. Releasing the buckle on the Quad is harder than most of the compeition. The Quad has a 5-point harness that is easy to put on, but slightly more difficult to take off. It offers adjustable crotch and shoulder straps. It is a unique design because you have to squeeze the top and bottom of the buckle to release, but the shoulder straps get in the way at the top making it challenging. This stroller has an adjustable leg rest, but no foot pad. The leg rest is padded and the bottom part is covered with a durable rubber type material. The edge under the knees is stiff and potentially uncomfortable for little ones wearing shorts. The recline on the Inglesina is easier to use than other strollers with the two side strap design. This stroller has an easy recline with push-button operation. The range is relatively infinite down to flat without designated recline levels. The Quad is not compatible with any infant car seat in its standard form. It does, however, offer a car seat adapter that can be used with the Maxi-Cosi® Mico AP & Prezi, Cybex® Aton, Aton 2, Aton Q, and the Nuna. The Quad's seat needs to be removed, and the adapter attaches to the frame and the car seats then click into the adapter. The Cybex Aton 2 scored fourth in our infant car seat review. We are disappointed that more seats are not compatible with this stroller. The Inglesina's documentation is so frustrating to use that we sort of winged it and put it together without them. It took us about 7 minutes to assemble this stroller earning it a 7 of 10 for ease of setup. Unfortunately, the documentation is poor and the first part of the manual is illustrations only while the directions are located several pages later. It requires flipping back and forth between pictures and the written description. The stroller isn't hard to put together, but we did end up winging the process because the manual was so frustrating to use. The Inglesina has plastic wheels that eel flimsy and cheap compared tot he competition. The Quad earned a 4 of 10 for maneuverability, which is 5 below the top score. The swivel front wheels on the Quad can be locked in place for easier movement over rough terrain. Pushing this stroller is not that easy. Pushing and turning on flat surfaces requires two hands at all times despite the claims that it is a one-handed operation. It has a wide track and did not fit easily into smaller spaces. We had difficulty with turning and it is a slow and wobbly process. Maneuvering on uneven surfaces was more difficult than flat. It is okay rolling over the grass, but it gets more difficult over gravel. We couldn't get it to roll over a 1-inch curb and the front wheels got caught on grates and over obstacles that other strollers managed easily. The Quad has a two part 4-5 step fold that is fairly convoluted. For weight and folded size the Quad earned a 5 of 10. This stroller weighs 27 lbs 2 ounces. Folded it measures over 14,000 cubic inches. This makes the stroller one of the larger options and it might be difficult to fit it in smaller trunks with several options measure closer to 6,500 cubic inches. The Quad earned a below average score for quality, with so many pieces and parts that it looks busy and flexes considerable. 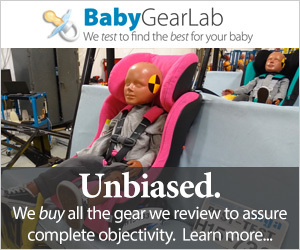 This stroller scored below average for quality with a 5 of 10. The fabric on the Quad seat and canopy is a softer feeling canvas. It feels like it would be difficult to clean and would soak up liquid, but the cover is removable with some effort. The storage basket is made from tightly woven mesh material with a hard plastic bottom covered in durable canvas. Notice all the parts in this small view of the brake/frame/wheel junction on the Quad, most of the strollers we looked at were far simpler in design. The frame is solid with a nice finish and tight junction points. The frame is different than the competition and we had trouble deciding if we liked it or not because there is a lot going on. The overall fit and finish is a little bit of a disappointment because some of the material feels like cheap sweatpants. The wheels on the Quad are foam filled plastic. While you will never have to worry about a flat tire, you will have to cope with decreased maneuverability and decreased passenger comfort. These wheels spin easily, but they feel cheap and flimsy. The handlebar on this stroller is adjustable with a good range for most parents. We liked the shape and feel of the handle, but it is really only average overall. The handlebar on the Quad adjusts by rotating the bar on the pivot point. The passenger comfort of this stroller is limited. It features front wheel shocks and little padding over the hard seat bottom. We suspect that longer trips will result in a potentially grumpy passenger.